Geographic Consulting specializes in reforestation, erosion control and wetland restoration. 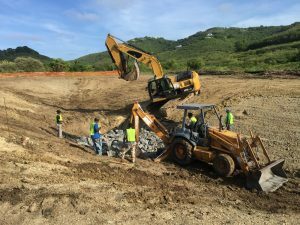 We recently had the pleasure of helping fix one small piece of St. Croix. 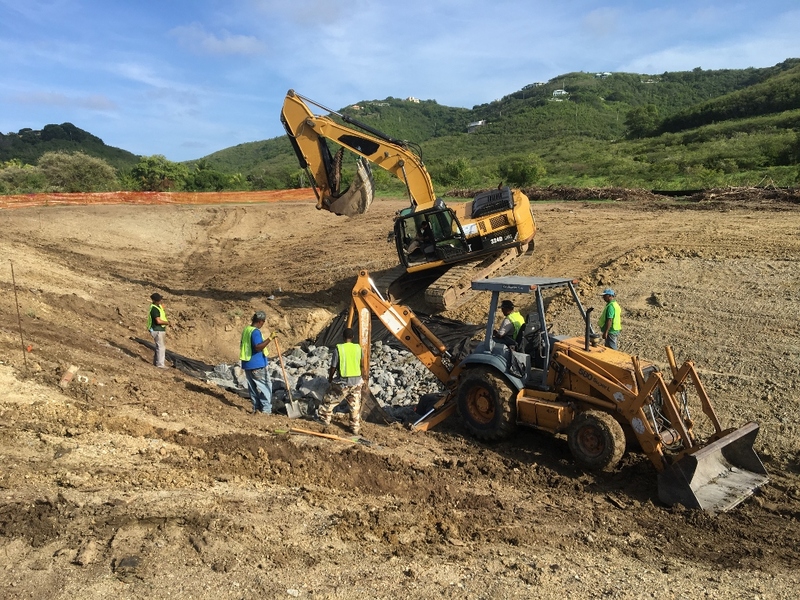 A gut (also known as an ephemeral stream) on the east end of St. Croix was eroding severely and soil was washing into the sea, harming the near shore benthic environment around Green Cay. 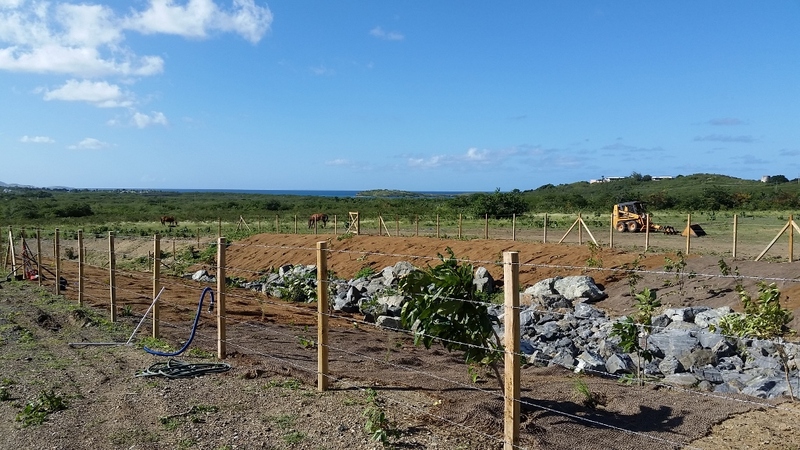 The Horsley Witten Group of Sandwich, Massachusetts managed the project and coordinated funding from National Oceanic and Atmospheric Administration (NOAA) and several other agencies. 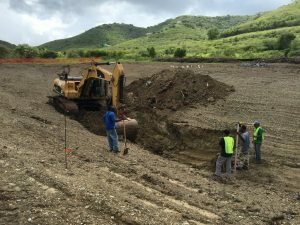 St. Croix Environmental Association, VI NRCS and other groups contributed their expertise. 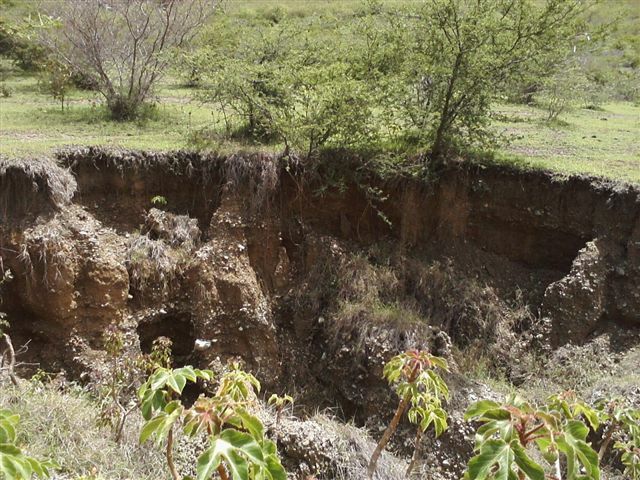 This type of erosion is called a head cut. This week in Sacramento California, a headcut formed in an enormous spillway of the Oroville Dam, jeopardizing its integrity and causing large scale evacuations. 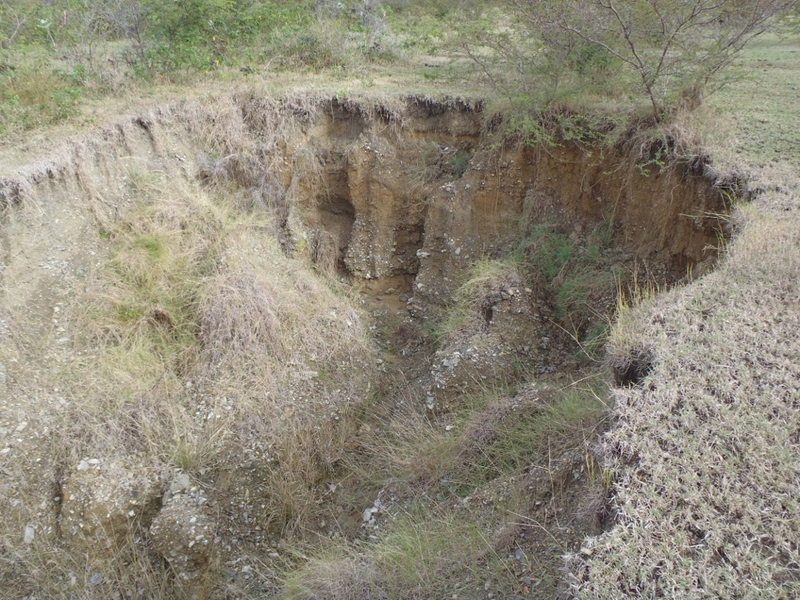 The headcut in the Green Cay gut resulted in sheer, unstable walls, a widening stream channel and severe soil erosion. 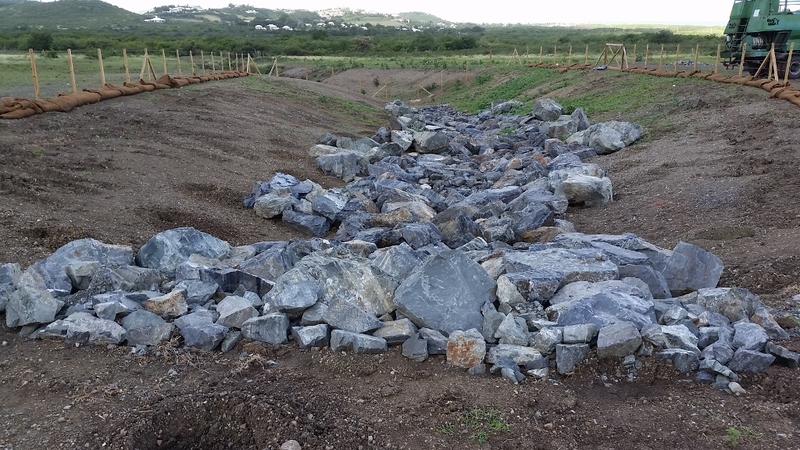 The solution was to regrade the stream banks, stabilize the stream bed with larges stones and revegetate the area. 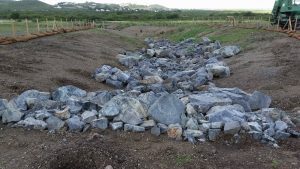 Marco St. Croix constructed the new banks and stream bed. The bed was then lined with large stones to slow the speed of the water and break up its energy. They rocks are also shaped into step pools, where each pool fills with water and then spills into the next. 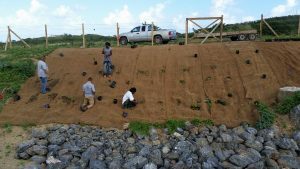 Anti-erosion fabric made of coconut fibers was installed to mitigate temporary erosion that could result following construction. 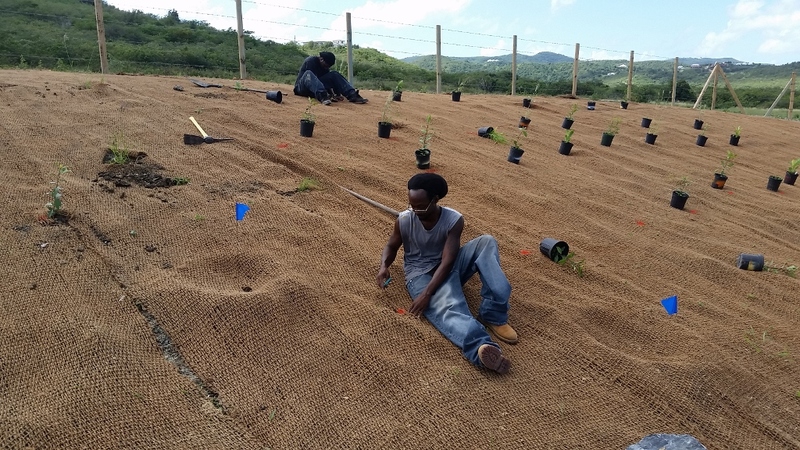 Geographic Consulting produced native plants in our tree nursery for the project. 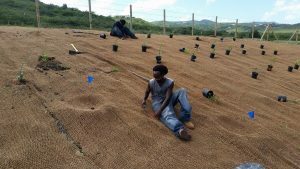 We installed native plants on the newly formed slopes by cutting the fabric. The plants will stabilize the bank long after the fabric decomposes. 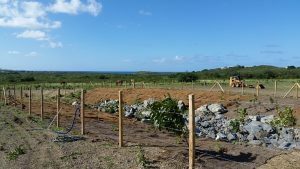 The native plants are adapted to the east end conditions and will provide wildlife habitat as they mature. 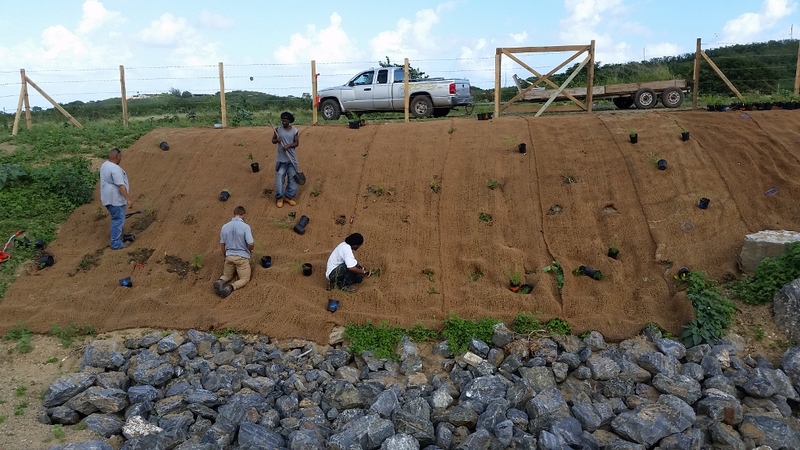 Larger native trees were planted at the top of the banks to ensure additional stabilization.